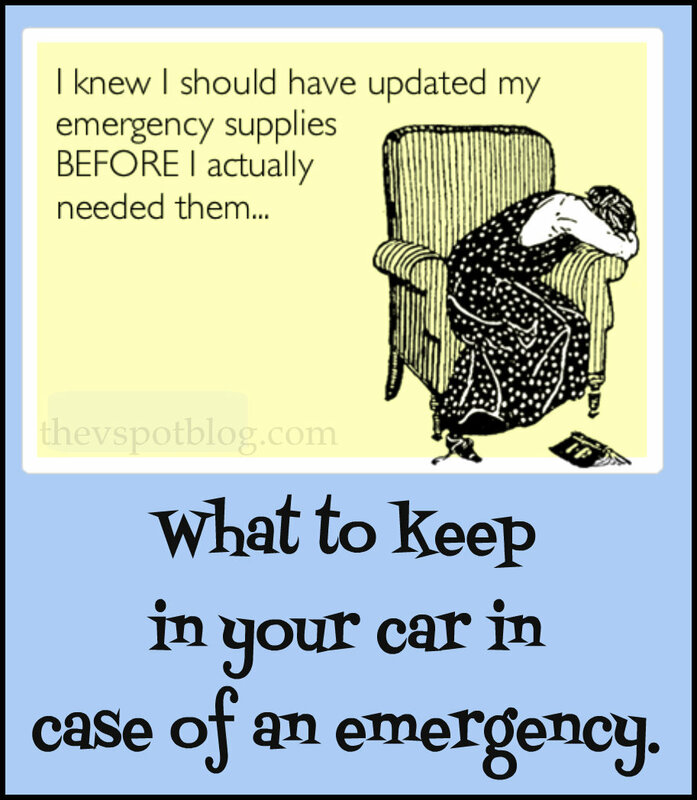 Basic emergency supplies you should keep in your car. I had a different post on tap for today, but I am feeling antsy and wanted to get this off my chest. 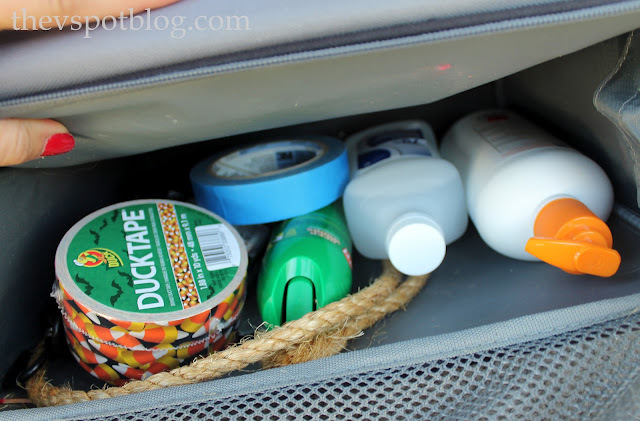 I do not panic easily… I am not a hysteric, but I firmly believe in being organized and being prepared. We have been having a lot of little earthquakes here in Southern California, and there have been several good sized quakes around the world in the last week or so. With each earthquake I have been reminded that I need to check and update the emergency supplies for the car. 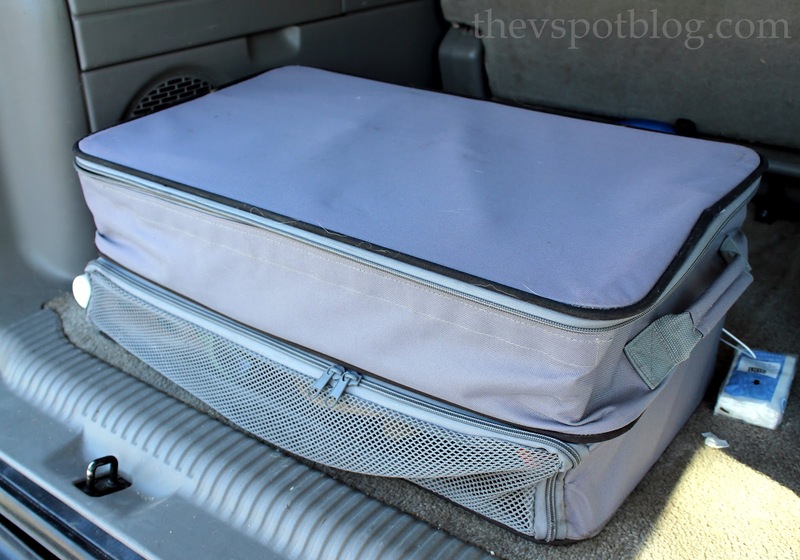 You don’t keep basic emergency supplies in your car…? Oh, honey, let’s talk. Obviously living in Southern California, I don’t have to worry about being snowed in or stuck in a blizzard, but I do have to worry about earthquakes, fires, and getting stuck in cataclysmic traffic jams. I keep my supplies in the back of my car, in what was designed to be a container to hold sports equipment in the car. It holds just about everything I might need in case of an emergency. You could use a bin, a backpack, whatever you like. You may wonder why I would have emergency phone numbers written down. I mean, aren’t they easily accessible on your phone…? What if your phone is dead? What if you lost your phone in an accident? What if you aren’t able to communicate and someone else needs access to those numbers? As much as we rely on our phones, it’s always good to have a back-up. I also keep items that might be helpful in case of a basic road-side emergency. These are some of the things I keep in this container besides first aid supplies. I also keep a case of bottled water and basic snacks that have a long shelf life like crackers, peanuts and peanut butter in the car. Granola bars and other items that won’t be too affected in a hot car are good. And since sometimes the emergency will include waiting for a tow truck, I also have decks of cards, dice and other things to keep us occupied. One other thing we try to do is have an idea where we would go if there was an emergency and we needed to leave our house. 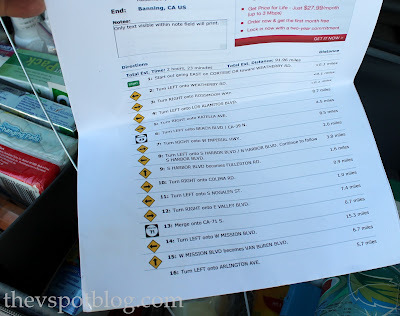 We used to have a cabin about 2 hours away (on the highway) and we made sure we had printed directions of various alternate routes that got us there via surface streets. We need to figure out a new destination, but we still keep the basic “get out of Dodge” directions in our supplies. Obviously this isn’t a one size fits all plan… but they are some basics and a good jumping off point. Please adjust your supplies based on the size and needs of your family (Extra diapers? An elder family member to care for?) Also take into account what weather will be most likely to affect you. It’s better to have supplies and not need them, then to need them and get hosed because you don’t have them. I know I’m forgetting something… help me out: what am I missing? Does the duct tape need to have candy corns on it, or is that a personal preference? All kidding aside very good info. 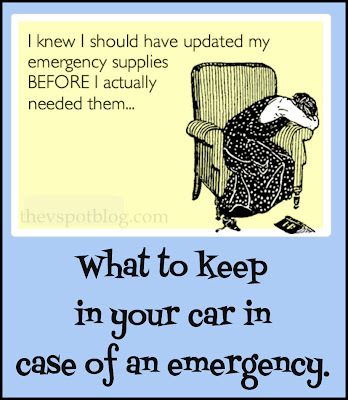 I have a little roadside emergency kit in my car but thats just your basic car jack, jumper cables and road flares. I will definitely be putting a first aid kit at least, in my car after this. Um. I need the candy corn duct tape TODAY! I like to keep a little cash for emergencies, too! What are the Huggies changing pads for? Great info.. can you give me your license number so I can flag you down as you drive past me so I can hitch a ride? I actually just bought a tote similar to that but its for the possible vomit that I’ve never been prepared for before and was only able to find a single floating sock to help clean my sick babies up– but looks like I need to think on a bigger scale. 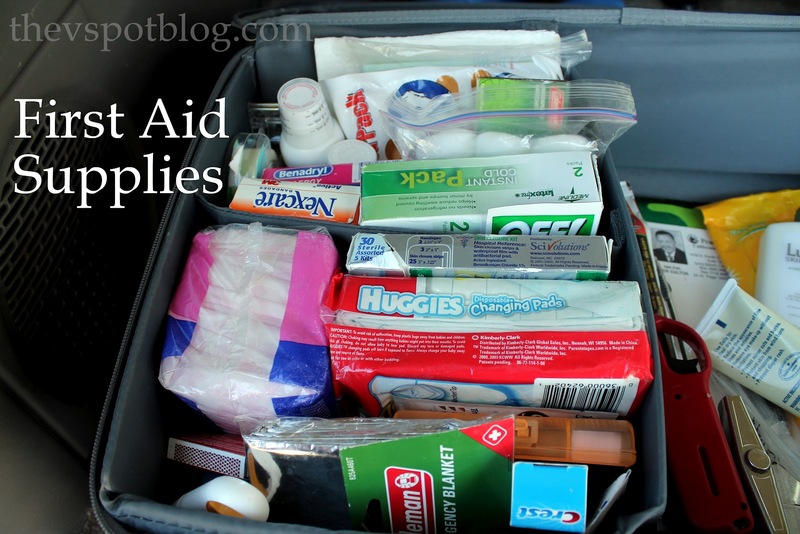 Diapers and wipes can only help so much. Great tips!! Fresh batteries for the flashlights would be good too. If you have to leave home in a realy big hurry, one item that can be easily forgotten is prescription medicine. Copies of prescriptions should be kept with emergency kits. Medicines that you need but don’t normally carry around with you may be hard to get filled at your “get out of Dodge” location if you don’t have copies of the prescription on hand. toilet paper, and stick a few plastice bags in a toilet paper roll or a paper towel roll. Great list! What a very helpful, and truly wonderful public service post this is. We are big believers in safety and emergency preparednes….with the emphasis being place on “believers”, the “doers” part is definitely falling short. We have things somewhat under control here at home, but my car is a sad state of disaster should a disaster strike. I especially love the list of phone numbers. I would never have thought of that for my car! Mark has his license in Ham Radio usage, in case cell phones go out, but this is the best tip I have seen and I am definitely sharing with my Mormon, emergency preparedness loving friends! PS printing your lists and forwarding to Mark who can share with others. Also, the food? Well that would be for me. I hate being starving and in the car. I hate to say I can’t go anywhere without a snack tucked in purse and a back up in my car. But, well I am always “packin”. Just a nit picky note. Maxi-pads are not sterile. They are certainly sanitary and hygienic and perfectly reasonable to use if you find yourself needing to bandage a large wound in a pinch, but they are definitely not sterile. It’s a misconception i see a great deal across the Web. It’s microbiological semantics I know but the health care provider in me can’t help but point out the difference. Otherwise, this is a really helpful post. Dog food, a bowl, a leash, & copy of health records (same for your kids: vaccine records & school records). Great reminder, V! Great tip about the mobile phone numbers – I’ll do that straight away and also add some coins to the cash I have too. Hope we never need these though!